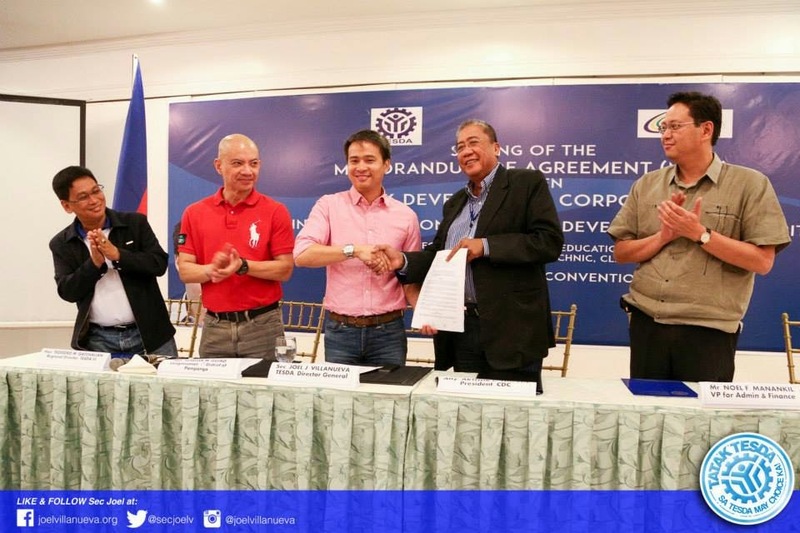 TESDA Director Joel Villanueva signed a Memorandum of Agreement with the Clark Development Corporation (CDC) in Clark Pampanga which attended by Atty. Arthur Tugade (CDC President and Chief Officer), Pampanga Congressman Yeng Guiao and Ted Gatchalian(TESDA Region 3 Regional Director). Aside from giving a job for Filipinos that is needed by locators in CDC such as tourism, industrial, hotel and restaurant services, agro-industry and business process outsourcing, the agreement also aims to strengthen partnership of different stakeholders in the generation of 100,000 jobs.